Rootstock: horizontal, thick. Leaves: oblong, acute. 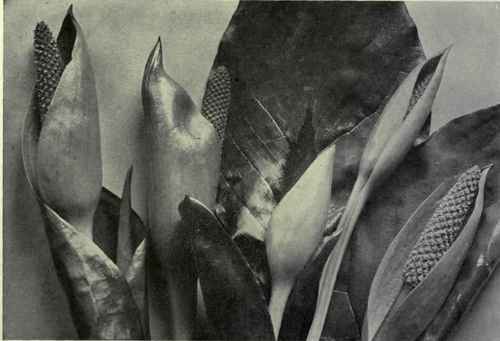 Flowers: perfect, crowded, covering the spadix, spathe with a broad acute blade narrowed to a sheathing petiole. Fruit: fleshy berries immersed in the spongy axis of the spadix, seeds large. This evil-smelling marsh herb has such handsome foliage and glorious lemon-yellow spathes enveloping the fleshy spikes of tiny flowers, that it always attracts the eye of the traveller. It resembles a huge Arum Lily, with the difference that in the Western Skunk Cabbage the spathe is erect and pointed, extends somewhat over the flower spike, and is not curled back at the top, as in the case of the white Arum Lily.